In May 2017, I played a few concerts in Denmark and Germany with the Danish duo Jensen & Bugge, and the great 83 years old American fiddler and accordion player, Dwight Lamb from Onowa, Iowa. On June 20th 2017 it was made public that Dwight is receiving the prestigious Bess Lomax Hawes National Heritage Fellowship. This is, as I understand it, the finest prize that is given to “Master Folk and Traditional Artists” in the US. 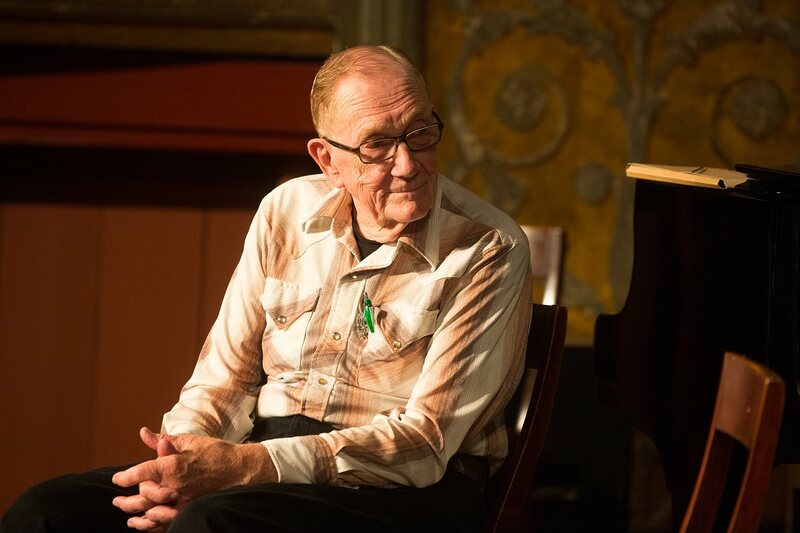 Dwight Lamb has played and communicated the American as well as the Danish traditional music for his whole life, and it is wonderful that this is being recognized, and that once again he is awarded for his huge effort! You can read Sioux City Journal’s article about Dwight Lamb Here! A summer in the world of music! A quick selfie of violinist Kristian Bugge and my self, fully occupied by instructing and playing for a “Scandinavian Dance”, at Armory Court Stage, on the 46. NorthWest FolkLife Festival in Seattle. How wonderful it was to return home to frederiksberg, Copenhagen, after 10 good days on tour in the US, from the peaceful West, over the prairie land in the North, to the vibrant East. 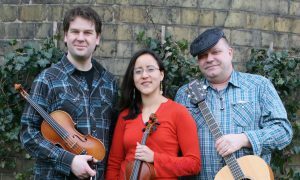 On this tour I performed with the Danish fiddler Kristian Bugge and, for some of the concerts, also with American metis fiddler Jamie Fox. That was a lot of fun, we performed at the huge NorthWest FolkLife Festival down town Seattle, we visited the reservation of Fort Belknap in Montana, and we played a bunch of traditional music plus some Danish songs, at the wonderful Grundlovsdag celebration (The Danish Constitutional Day), organized by the people from The Danish Home, about an our from New York City. After four years of touring, I have stopped playing in the trio Gangspil. 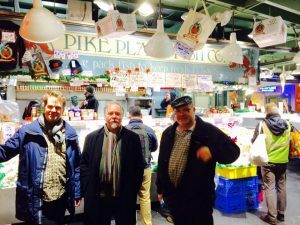 Gangspil is quite a busy band that dig deep into – and promote – Danish traditional music, and after more than 5o concerts in USA in 2016, I just need to spend some time on writing and working on my own music. And speaking about folk music summer: I will be touring on Faroe Islands in July with Kristian Bugge and Mette Kathrine Jensen Stærk, and there we will be working with the dance and concert repertoire, that we will be video recording at Musik over Præstø Fjord on Friday August 11th 2017. I really look forward to a lovely summer in the world of music! North West Folk Life – celebrating cultural diversity! NorthWest FolkLife is happening in the center of Seattle, under the 55 years old and 184 meter tall tower and landmark, Space Needle. 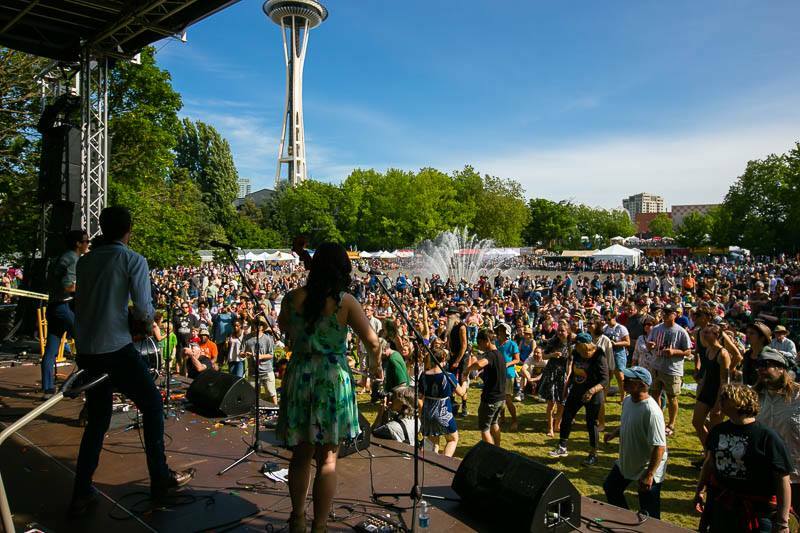 During the days of 26th to 29th of May, I’ll be visiting the huge NorthWest FolkLife Festival in Seattle Washington, on the American West coast – one of the largest folk- and world music festivals in the world. 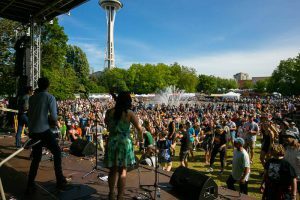 The festival is celebrating the cultural diversity of the Pacific NorthWest, and draws a huge crowd of up to 250.000 people, who experience and interact with about 5.000 artists from 5 neighboring states. 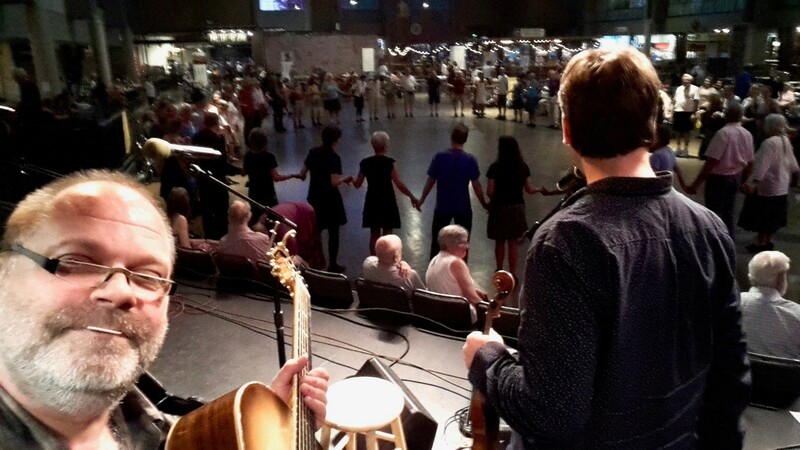 I love this festival, and I have performed at the festival with the Danish fiddler Harald Haugaard (Haugaard & Høirup), and with my old friend, the great American fiddler Ruthie Dornfeld (American Café Orchestra), who actually lives in Seattle. But this year I am in a very special situation, I am going to perform at the festival with the awarded Danish fiddler Kristian Bugge. 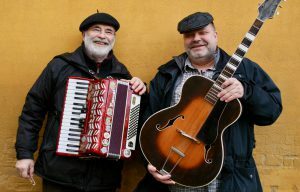 We have played as a duo before, but this is the first time that we play just the two of us outside Denmark, and I am very much looking forward to play our special blend of traditional and new Danish music as a duo, but also sometimes assisted by Ruthie Dornfeld, and by Kristians wife, the American Métis fiddler Jamie Fox. Get more info at www.nwfolklife.org, and see a 10 minutes video about the festival here! A legend comes to town! 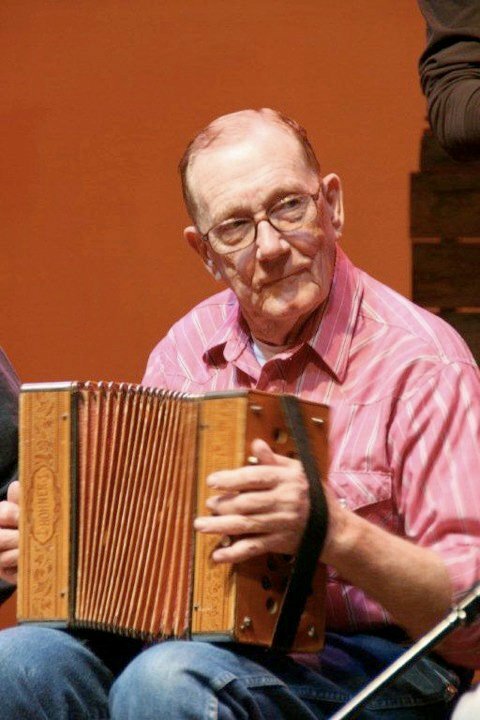 Dwight “Red” Lamb playing his old two row G major accordion. On the 18th of May 2017, I’ll be playing at Flensborghus in Flensborg, Northern Germany, as part of the folkBaltica Festival. I am joining the Danish duo Jensen & Bugge (accordionist Mette Kathrine Jensen and violinist Kristian Bugge), and the old fiddle legend, Dwight Lamb. The day after, on the 19th of May, we will be performing in the town hall of Ecernförde, and on May 20th, we play at Bartof Station in Frederiksberg, Copenhagen. 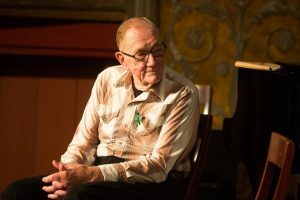 83 year old Dwight Lamb is a well known and very respected local fiddler from Onawa in Iowa. But he is also specialized in traditional music from Vendsyssel in the Northern part of Denmark, where his grand father, Chris Jerup, grew up and lived as a well known musician, until he immigrated to the US, to settle down as a farmer, in the late 19th century. And this music Dwight exclusively learned to play on the accordion, by his grandfather. A few years ago, I recorded a live album at Højbystævnet on Funen, Denmark, together with Dwight and Jensen & Bugge, as well as the great trombone player, Anders ringgaard, but except for that, I have played only a few concerts with Dwight in Denmark. folkBaltica will be our first festival as a band, and I am looking very much forward to that – it is an honor to play with Mr. Dwight Lamb. Here you can se a funny video featuring Dwight and Jensen & Bugge, and here is another one with Dwight Lamb Orchestra at Højbystævnet 2013. Enjoy! 40 years of songs and music by father and son! Father and son in 2017. The old Danish build Barslev guitar has been taken out and cleaned up. As far as we remember (!) it was in 1977, when I was 16 years old, that I began playing in public with my father, Fin Alfred Larsen. In the beginning I was a substitute in Den Røde Lue (The Red Hat) – my fathers busy and pretty left wing agitation as well as dance band, but I also did school concerts and so on, with Ejnar Kampp (Tingluti) amongst others. Soon I became a regulary member of Fin Alfred’s wedding band, where I was lucky enough to learn the craft of a dance musician by and with local musicians like Hans Leonardo Pedersen (sax, clarinet, flutes), Ole Sterndorff (banjo), Anders Hofset (double bass) and many, many more. Later we traveled around as duo and trio with Fin Alfred’s huge repertoire of labour songs, soldiers songs, love songs, joking songs and so on. In 2002 we won a Danish Music Award (Danish “Grammy”) for “Ballad Album of the Year”, which led to even more concerts around the country. And to day 40 years later we still travel the roads of this beautiful old country, and we do it with great pleasure. We actually intend to continue until the day come when we prefer to sit by the fireplace, drinking port while talking about the good old days, and that won’t be anytime soon, i guarantee! Tønder Festival, Ballerup Kræmmermarked, Nørrebro Festival, Eventyrenes Klub i Nyhavn, Godtfolk Festival på Fanø, Nørrebro Spilletræf, Ullerup Kræmmermarked, Copenhagen Folk Club, Visens Venner, Kirsebærhaven, Spøttrup Middelaldermarked, Halkær Festival, Kerteminde Havn, Dragør Festival, Arbejdermuseet, Land og Folk Festival, Amagermuseet, folkBaltica (D), Musik over Præstø Fjord, Hagge’s Musikpub, Skagen Festival, Bardentreffen Nürnberg (D) osv. On October 28th 2017 at 11:30am to 02:00pm, I’ll be doing a pretty special concert with the awarded Danish fiddler Kristian Bugge and the American fiddler and tradition carrier Jamie Fox at Farum Kulturhus, Copenhagen Denmark. We are offering a unique concert of traditional music from Denmark, Canada and the US, spiced up with a few old Danish songs and a hand full of new compositions. All served with a twinkel in the eye and some good stories from life on the international forl and world music scene. Already in late May and early June we’ll be playing a few concerts in the NorthWest of US, get more info by checking the calendar on this website..
Kristian Bugge (1979) has received a number of Danish Music Awards (Danish “Grammy”), amongst them one as Danish Folk Musician of the Year 2016. He is a recognized tradition carrier, and he tours all over Europe, USA, Canada AND South America promoting traditional Danish music. Jamie Fox (1989) is from the Fort Belknap reservation in Montana USA, and she is one of the most coveted and well-known young players of the Métis fiddle music. She grew up in a large and very musical family, and she has been dancing and playing the fiddle ever since she was a child. She is highly respected for her work promoting the special Métis fiddle tradition in the rest of world. Morten Alfred Høirup (1961) has been touring in Europe, USA, Canada, Japan, Australia and New Zealand since 1985. He has received a number of awards, including a Danish Music Award as Danish Folk Composer of the Year 2004. Morten Alfred has played the guitar and composed music ever since he was a little kid, that way he is part of renewing Danish folk music. 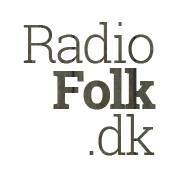 LISTEN TO DANISH ROOTS, FOLK & TRAD MUSIC AT RADIOFOLK.DK! I have worked with radio and media ever since the early eighties, especially featuring the Danish and International Roots, Folk & Trad music scene. During the last three years I have been an editor, producer, presenter and dj at RadioFolk.dk, a small online radio station with lots of Roots and Folk, Blues, Song-writer and World Music from Denmark. At RadioFolk.dk you can listen to programs like Katten i Sækken (The Cat in the Bag), introducing news from the Danish folk music scene, Tonesproget, news from the world of the Danish song-writers, Kompas, music from the Danish World Music scene, Blues on Demand, with news from the Danish Blues scene, and Folk Live, with Live recordings of Danish bands – often hosted in English! These programs are hosted in Danish or English by changing hostes, very often musicians and composers from the Danish music scene. Another very popular program is What’s Cooking Folks?, a show where musicians from Denmark and beyond present Cd’s and tell about what is happening in the country or area from where they come. The hostes are, amongst others, the Finnish multi instrumentalist Arto Järvelä, the Swedish violinist Anna Lindblad, the Danish violinist Kristian Bugge, Native American fiddler Jamie Fox, and French-Canadian fiddler David Boulanger. I love doing radio, it’s is a great way to tell the stories of the music scene, and I have been doing this in more than 30 years. WOW – WE JUST GOT A DANISH “GRAMMY”! On November 26th. my trio Gangspil got a Danish Music Award in the category of traditional music, . We gt it partly for our album “Gangspil”, and partly for our work of promoting traditional Danish music in the US and Canada. We have performed more than 50 concerts in 9 states and provinses on the Amerrican (and Canadian) West Coast and in the Midwest in 2016, and we are pretty proud of that. We also feel humble since all our “oponents”, would have deserved to get this award as well. Kristian was the only one from our little trio that was actualy present at the big award party, and he could not only recieve our award, but also one well deserved one for himself as Folk Musician/Instrumentalist of the Year. Now we are about to finnish our last US tour this year, and soon I will get home to a mixed cocktail of piles of work that I have to get to bottom of, and a beginning Christmas mood, that I am looking forward to dive in to togehter with friends and family. 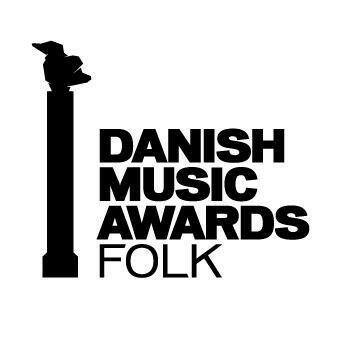 GANGSPIL NOMINATED FOR DANISH “GRAMMY”! Hey, Gangspil was just nominated for a Danish Music Award (Danish “Grammy”) in the category “Traditionsprisen 2016” (Traditional 2016), and of cause we are very happy about that. One of the reasons that we are happy is that all the nominated are very good and well respected musicians and bands, so in that way we kind of feel that we already won a little, just to be part of this nomination. The winner of the “Traditional Music” category will be revealed at the great galla party in Tønder Kulturhus on November 26th, and that’s also when we find out who will receive the prize in the category “Årets Musiker/Instrumentalist 2016” (Folk Musician/Instrumentalist of the Year 2016), were as well Kristian, Sonnich and I myself has been nominated, in direct competition with each other, as well as two other great musicians from the Danish folk scene. This is going to be super fun, and we consider this a great tribute to our debut album, as well as our project about presenting this great Danish music in The US, which we have worked so hard on doing the last couple of years. THE SOUND OF DANISH CHRISTMASS! The Danish trio Gangspil – Lydom, Bugge & Høirup are getting ready for our fourth and last tour in The US this year, and it will happen between November 28th and December 4th. I myself will leave Denmark a few days early, to spend some time in Oregon with my good friend violinist Ruthie Dornfeld and her family, whom I have come to know well through the years. Ruthie and I go way back, all the way to the early 1980’s, when we started ACO (The American Café Orchestra) together, and toured in Denmark, Germany, Sweden, Finland and The US. On November 28th, Kristian and Sonnich will be arriving in Seattle, and then our very first American Christmass tour can take its beginning. 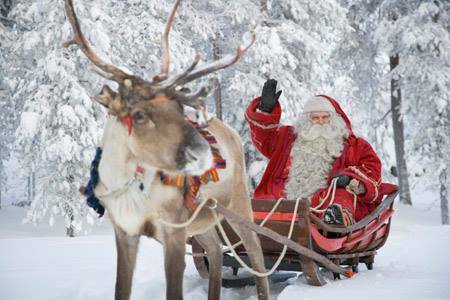 Our little tour will start in Poulsbo Washington and end in Portland in Oregon, where the dear Scandies will flock to join the very popular Scandinavian Christmass fair, ScanFair 2018. But first we will visit to the State of Washington, where we are performing and teaching in traditional Danish music and dance at Sons of Norway in Poulsbo, and to the city of Olympia, to perform at Traditions Café, and as far as I know, we will do a concert in Seattle as well. While being on the road we will take a little detour to the North, to Canada, to share real Danish “julehygge” with the people at The Danish Lutheran Church of Vancouver where the Danish Pastor Birgitte Saltorp reigns. But finally we will end this tour at the Scandinavian Christmass fair, ScanFair 2016, in Portland Oregon, with music and “julehygge” on December 3rd and 4th, befor we leave for Denmark on December 5th. At ScanFair we do four concerts in a wonderful chaos of happy people in Christmass mood, and Scandinavian food specialities, such as meat balls, lutfish, apple fritters and medisterpølse (pronounced “meet-easter-pearls”), and lots of more or less homemade crafts. I might add that our new album “Gangspil” (Capstan) containing traditional Danish music and singing, arranged for accordion, harmonica, fiddle, guitars and vocals, would make a very good Christmass present this year! All in all I am pretty sure that Christmass mood will come to Frederiksberg, where I live, even earlier than normal this year. It would be rather strange if not!